My first few days with Lozange Lab’s Swim Out involved a lot of rage quitting. 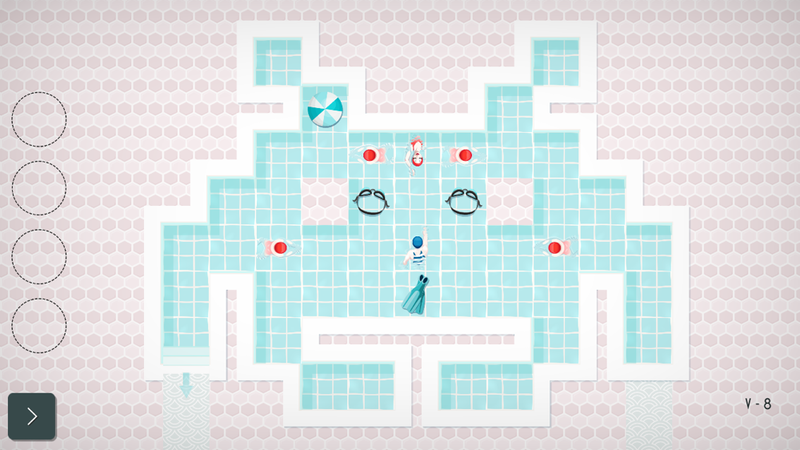 I’ve come to expect certain things from puzzle games, and one of those is an undo button. It’s not always necessary, but when a level can include thirty to forty moves, I’m not too thrilled when I’m forced to constantly restart. Still, there was something so compelling about Swim Out and I persisted enough to get through the first four chapters, collecting all the stars. I’m not sure if I’ll get much farther than that, but I did enjoy a lot of what I played. 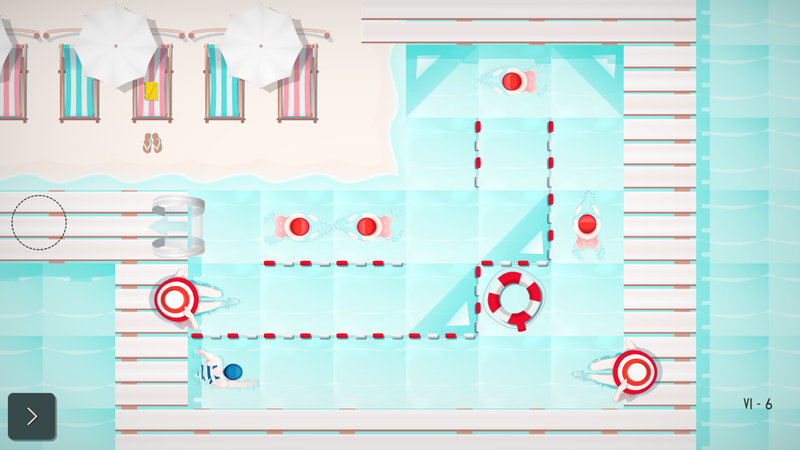 At its core, Swim Out is a strategic turn-based puzzler similar to Hitman GO, but it all takes place in the water. 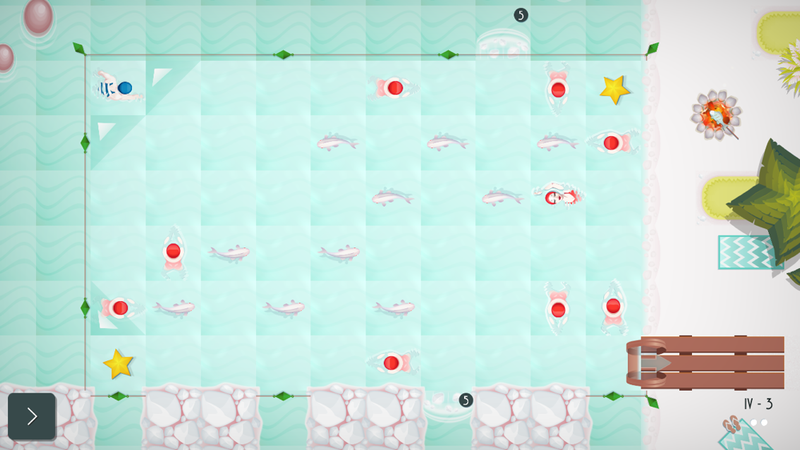 You swipe to move your swimmer through a gridded body of water, usually one square at a time. Sometimes, you’ll have to use things like a kickboard, noodle or kayak, which all have different movement patterns to shake things up. The game is spread out into seven chapters of about fifteen levels each. The goal in each level is, as one might guess from the name, to exit the pool. And then enter another one? I don’t know. Things get a lot weirder than that, so it’s best not to ask. Just solve the puzzles. Of course, this wouldn’t be much of a game if there weren’t obstacles in your way. These come in the form of other swimmers, divers, waves, crabs, fish, volleyballs, boomerangs, and much more. 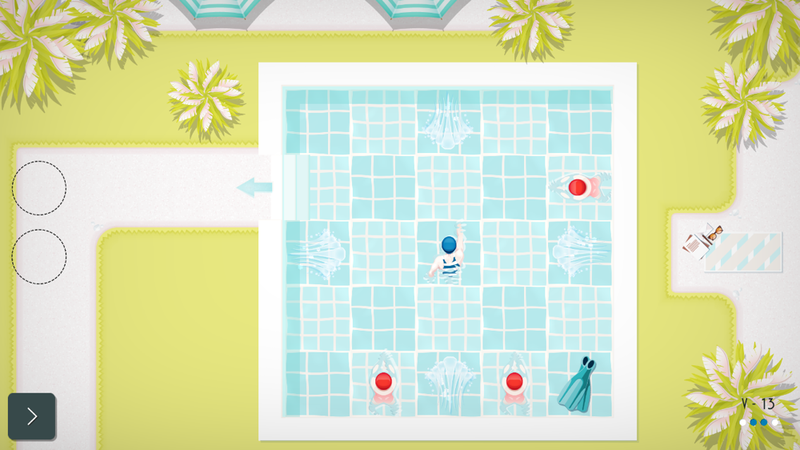 The game boasts twelve different kinds of swimmers and six disruptive environmental elements. If you hit a swimmer or a swimmer hits you, it’s game over and you have to restart that level from the beginning. Things like waves and fish will stun you temporarily if they touch you. And if they stun you while another swimmer is approaching you, it’s likely game over. Everything in this game does one of two things — stuns you or ends you. There are different types of swimmers with different movement patterns to keep things interesting. For instance, a backstroker moves one square every other turn, but some other swimmers will move two squares each turn. Divers splash as they land, creating waves that stun your or other swimmers. 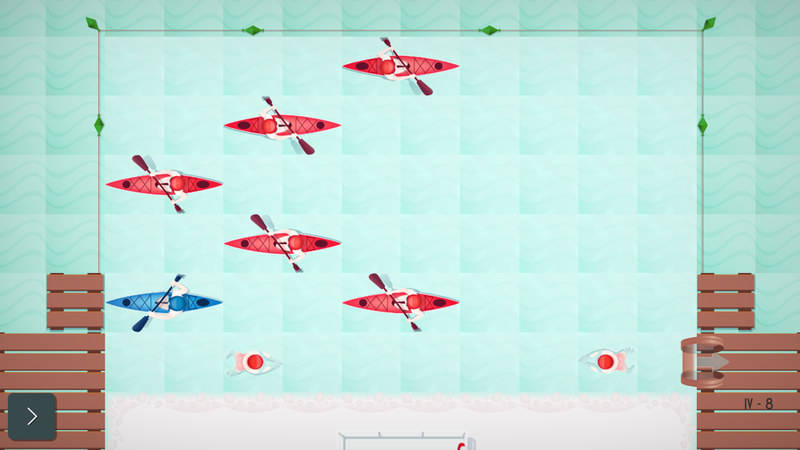 Kayaks take up two squares and also move two squares at a time. Later, you’ll encounter people throwing volleyballs or boomerangs at you and fishermen fishing at crowded beaches (I told you not to ask). The game has a sense of humor, even though there’s no dialogue. There are also twelve different items you can interact with, but some act as vehicles, like the kickboard or noodle. Others, like goggles or a beach ball can be picked up and carried around to use in the level where you find them. Others you pick up, like the fishing net or lifesaver, have to be used as soon as you get them. And most items have the same effect on other swimmers — you can stun them. Some items shake things up a bit by letting you skip a turn or move two spaces in one turn. But the gist of it is that you’re either moving, stunned, or stunning someone else. While waves, fish, crabs and boomerangs have different movement patterns, they all have pretty much the same effect on you. If you’re stunned, you’re powerless to stop another swimmer from hitting you. But sometimes you want to be stunned so everything can move a bit without you, giving you a chance to get properly in sync. The variety of obstacles and items makes for some really solid puzzles that are truly satisfying to solve. On top of the main goal to get to the exit, some levels have secondary objectives. This could involve collecting stars or completing the level without a certain item. Maybe you’ll need to get to the exit in a certain number of moves and pick up a star along the way. To complete the primary objectives, you never have to worry about move count, though, unless the puzzle design is forcing you to do so to get to the exit altogether. The secondary objectives add some replay value to the game and sometimes even give you a hint as to how to solve a level. For instance, if you know there’s a way to get to the exit in a certain number of moves, that can help you plan out your path. I liked that there’s no tutorial whatsoever. It’s a very minimalistic game with no words or instructions. You need to discover what items do by trying them out and work out enemies’ movement patterns by watching them. The game sometimes eases you into things by letting you learn how to use a new mechanic without too much going on around you. But it never holds your hand. If you pick up a beach ball or goggles, the only way you’re going to know what it does is by using it. That will usually mean having to restart, but that’s how you learn here. If you want a game with a lengthy tutorial, you’ve come to the wrong place. All the different elements lend themselves to some interesting puzzle solutions. I preferred the shorter clever ones over those that involved a lot of shuffling around. I stuck with the game for a long time through my frustrations because there’s a lot to like here. Solving puzzles is often satisfying, especially when it involves thinking outside the box. While I haven’t completed the game yet, I have gotten all stars on the first four areas and am now working on the fifth of seven. Things get much more involved, so I don’t know if I’ll make it through everything in the near future. This is due to some odd design choices. What’s holding me back at this point is the lack of an undo button. Barring that, I would have at least appreciated checkpoints on the multi-pool levels. Perhaps it’s meant to make the game seem harder, but having to redo entire pools you’ve already solved just to get back to a completely separate pool that you’re still trying to figure out, is super tedious. 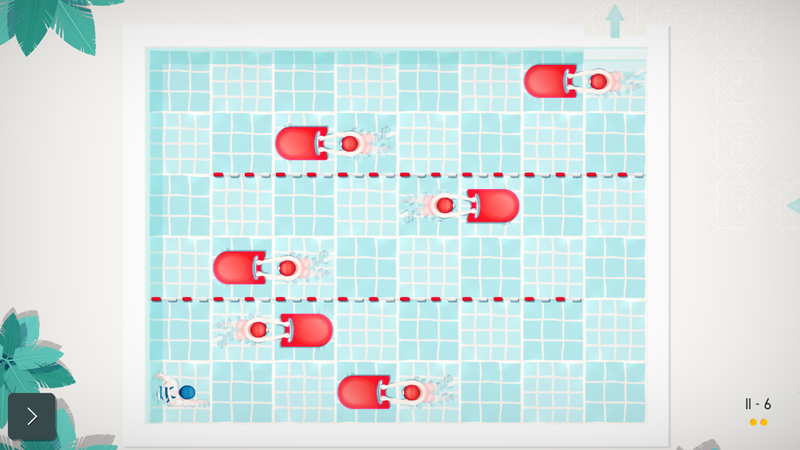 For instance, there’s a level where you have to pick up fins in the first pool and then take them to the second. But the first pool is super easy to get through. It just means an extra fourteen moves until you can get back to the second pool to have another go at it — and the third pool after that! This is already chapter 5, so why is there an easy pool that just wastes my time? Let me work on the trickier stuff on its own without all the extra nonsense. Sometimes, you need to take an item from one pool to another, so it makes sense for those to be part of the same level. But sticking two pools that are unrelated into one level just to artificially increase the challenge makes the game feel tiresome at times. It would be fine if there were checkpoints or an undo button — just something to ease the tedium of playing the same thing over and over. There are some shorter levels peppered among the long ones to break up the pace a bit. I don’t want to call them easier, but they do require fewer moves, which can be a bit of a relief after playing through a level that spans three pools and involves using several different items. I’m not sure why a puzzle game has to be so punishing. 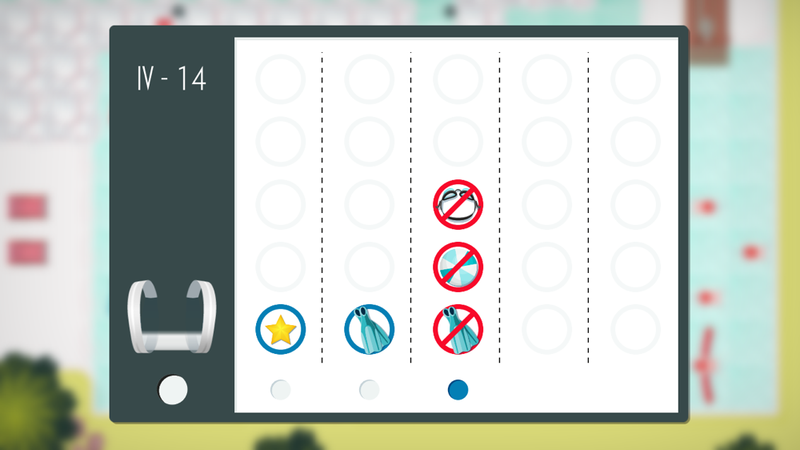 In fact, one of my favorite puzzles was also one that nearly made me throw my phone. It had a new mechanic I never thought to use before simply because I never needed to. But instead of introducing it with a short level to make it satisfying to discover, it’s part of a much more complex puzzle that is not that much fun to repeat if you missed out on that new mechanic. You also can’t see ahead to the next pool, so until you get to it there’s no telling what you’ll need. And if you fail and didn’t take a screenshot, there’s no way to study it before moving ahead. The game is full of these odd design choices that hamper enjoyment unnecessarily. I probably would have given up on Snakebird early on if not for the undo button, but instead it’s one of my favorite games ever. 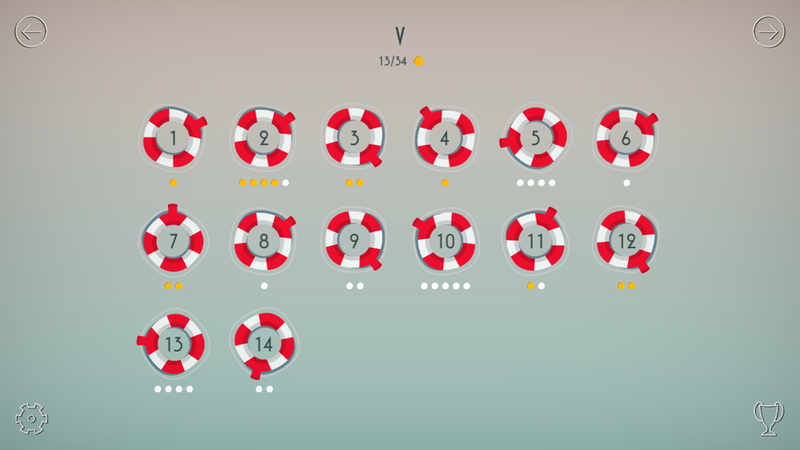 I just wish Swim Out could have believed enough in the strength of its own puzzles not to artificially increase the difficulty level. One saving grace is that all levels are unlocked from the very start. So if you are stuck on a particularly difficult or tedious level, you can jump around to any of the others and see if you find them more enjoyable. This did help, especially early on while I was still learning the ropes. And if I do complete any more of the game, it will be because I’m not forced to play it in order. If the game had a strict linear path through all the content, I’d have been more hesitant to recommend it. There are levels even early on that could turn some people away, but are more approachable once you’ve solved some later ones. So I think it’s worth picking up as long as you don’t mind that you might not finish the entire game and collect all stars if you’re not either super perceptive and able to plan twenty or so moves ahead, or have the patience of a monk. The game also includes iCloud sync, so you can play on multiple devices without having to play catchup. Oddly, it’s stuck in landscape mode even though it’s the perfect one-finger portrait game. In fact, I’ve been playing it in portrait mode anyway, because it just feels so natural for this kind of game. The only down side is that menus and the level select screen are sideways. But otherwise, it plays great that way. Since everything is a top-down view, there’s no awkward angle caused by doing so. I highly recommend trying it if you like playing games one-handed. 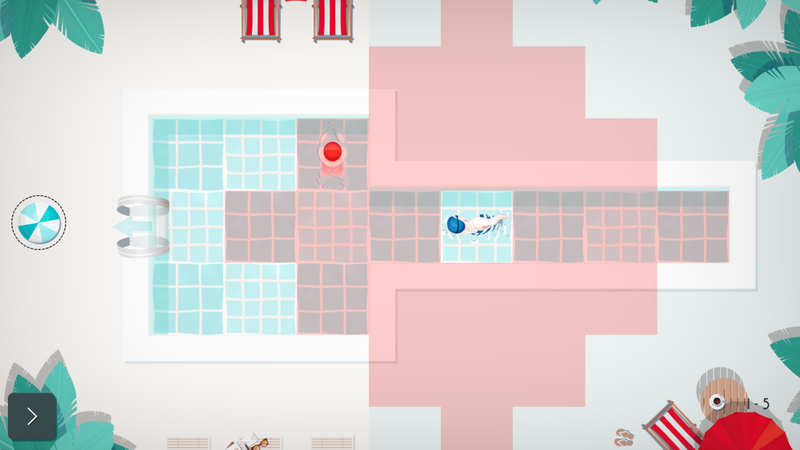 As much as I want to recommend Swim Out to every puzzle fan, it’s hard to do so whole-heartedly. I enjoyed what I played so far, though there were plenty of frustrations. I wouldn’t have worked through as many of the puzzles as I did if I didn’t like it. The content I haven’t completed yet is full of interesting ideas and I’ve had several “aha!” moments while working on them. But the majority of them are just too big for their own good. Even after finally figuring out what the game wants me to do, it’s too easy to mess up and have to start over, often redoing areas I already completed. Or I might not even get to the clever bit because I’m busy navigating through thirty different moving obstacles to get there. The bigger levels feel like they need an undo button — even a limited one — or checkpoints to give us a bit of breathing room. I really like what this game offers, but with the sheer number of games coming out every day, how much can one be expected to play the same thing over and over? This isn’t a reflex-based game where you just have to “git gud.” And I get the concern that an undo button could make it too easy. But I think something has to give in order for me to push through to the end. Still, there’s a lot of content here for your money. So if these concerns don’t bother you and you’re willing to take a chance on the game despite its weak points, water you waiting for? Grab Swim Out here. And make sure to try my guide if you need some help.